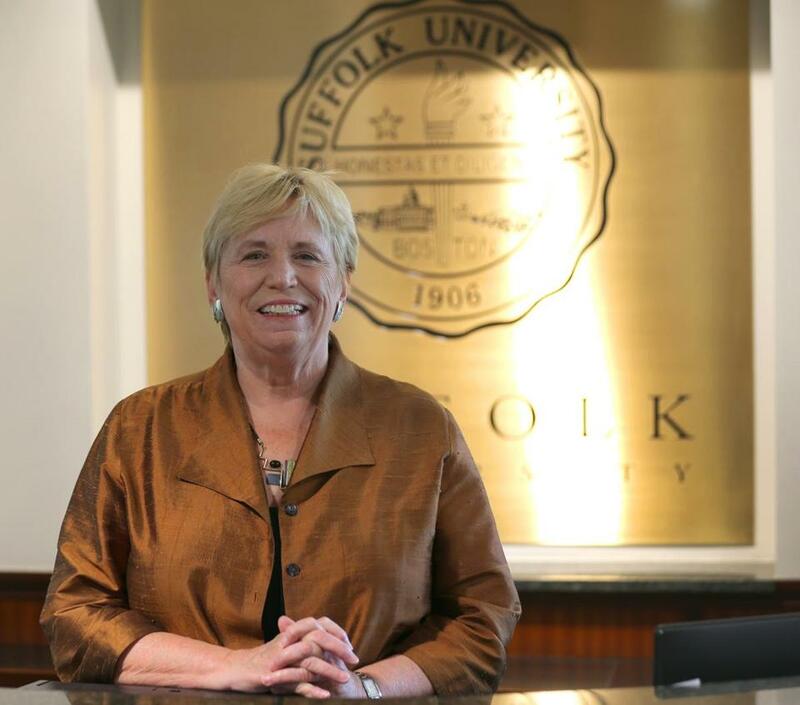 Suffolk University president Margaret McKenna will keep her job for now but will step down no later than the fall of 2017, when a new president will take over, according to an agreement approved Friday by the Suffolk board of trustees. The agreement, which includes a commitment from board chairman Andrew Meyer to leave his post when his term expires in May, follows a weeklong public drama over a movement on the board to fire McKenna, just seven months into her presidency. Under the agreement, the board also will adopt by May new bylaws “that reflect best practices in higher education,” a step recommended two years ago by the accreditation arm of the New England Association of Schools and Colleges. McKenna said in an interview after the vote that the bylaw changes to improve the governance of the school were more important to her than keeping the presidency, and she thought she had to step down if the reforms were to be part of the deal. “I don’t know what would have happened if [her job status] had come down to a vote of the board, but I do know that would not have been a good thing for the university to have that much divisiveness,” she said. The deal is intended to resolve an ugly feud over a board attempt to fire Margaret McKenna seven months into her tenure. Meyer did not return a call seeking comment. Once the bylaws are updated and Meyer is gone, the school will form a search committee to find a new, permanent president, according to the statement. Trustees had contended that McKenna made unauthorized expenditures and had an abrasive personality; she offered a rebuttal to the board’s charges and drew support from students, faculty, and Mayor Martin J. Walsh. The compromise may begin to ease pressure on the school, which has been consumed for a week with the nasty dispute over McKenna’s fate. The deal also frees the board from the tough task of finding a new president immediately, in the wake of a public relations disaster that might scare off qualified candidates. But the arrangement also sets up Suffolk for more uncertainty and another transition at the top. The new president would be the school’s sixth since 2010. McKenna said the deal provides some stability during the presidential search by eliminating the need for an interim president. She said she is not interested in being a candidate under the new search. Reforming the board and fixing the problems cited by accreditors — including unclear lines of authority at Suffolk — will be key to attracting quality candidates, said Monroe “Bud” Moseley, vice president at Boston-based higher education executive search firm Isaacson, Miller. “Once that particular fulcrum is balanced, then you will have candidates who believe they can serve under that kind of board, under the context of a reformed board,” Moseley said. Trustees have been under withering pressure this week to keep McKenna: Students, alumni, faculty, business leaders, and Walsh have all offered support for the embattled president, a former civil rights lawyer who was head of Lesley University and has served on the Boston School Committee. The faculty senate Friday said it is pleased Meyer will step down and the bylaws will be updated but professors want to know more about the agreement. “While we are relieved that the immediate crisis has passed, the faculty senate will continue to insist on attainment of meaningful and urgent reform,” said a statement sent by chairman Ken Cosgrove. An alumni group that opposed McKenna’s ouster said Meyer and his executive committee ought to step down immediately. “While we believed that President McKenna’s entire contract should be fulfilled, we are hopeful that we may engage regularly with her office and the Board of Trustees so that we may work together on securing a reasonable new era of governance at Suffolk,” the group, Alumni for the Integrity of Suffolk University, said in a statement. Before the deal was announced, a group of about 60 students and professors braved a steady snowfall to beat drums and chant “We want McKenna” on the street outside One Post Office Square, where trustees gathered. “Do we trust the trustees? No!” students shouted outside the marble and glass lobby, as employees who work in the building stared out at them. Biochemistry and chemistry professor Martha Richmond was among the Suffolk group. “Nobody in an administrative position is ever going to do everything that people like, but she has vision,” Richmond said, referring to McKenna. Richmond said the school’s leadership carousel the past several years has been stressful for professors, as have multiple rounds of layoffs. “It’s just had a huge, huge impact on the community, and she sort of came here with a real commitment to bring some stability, not only bring some stability but move us forward,” Richmond said. Samuel Zeiberg, a senior studying theater and history, said the board doesn’t accurately represent students and faculty. “I would like to see the board of trustees recognize the voice of Suffolk University students and faculty and recognize that we are not happy with how they’ve been running the show the last couple years,” said Zeiberg, who is from Malden. The Globe has reported that McKenna was told privately late last month that a majority of the board was prepared to vote to fire her if she did not resign. McKenna’s opponents on the board planned to replace her with former state attorney general Martha Coakley, now a private lawyer. McKenna acknowledged some tension with the board, but dug in and refused to leave. 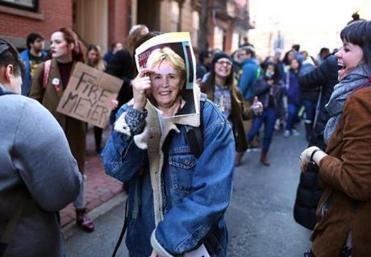 A week ago, the board scheduled Friday’s meeting to vote on whether to fire McKenna, but the Suffolk University community rallied to McKenna’s defense in the meantime. Plans to replace McKenna suffered a major blow when Coakley announced Tuesday she didn’t want the job. The unusually public battle has drawn the attention of regulators: Attorney General Maura Healey’s office asked Suffolk to explain why it had not updated its bylaws, as university accreditors had instructed in 2014. The accrediting agency also wants answers. Mark Arsenault can be reached at mark.arsenault@globe.com. Laura Krantz can be reached at laura.krantz@globe.com.